""No one really listens to anyone else, and if you try it for a while you'll see why." Caring for "the least of these"? Sojourners' Jim Wallis has been given the soapbox this issue to speak about how we are doing as a country when it comes to caring for those who are poor, elderly, not as privileged... click here. Duct Tape and the Holidays - a perfect match! Duct tape is the perfect tool for anytime of year, but when it comes to the holidays it shines! Not only as a gift, but in preparations for the holidays. From wrapping gifts to displaying greeting cards and decorating the house, it's still the handiest, most versatile tool around. 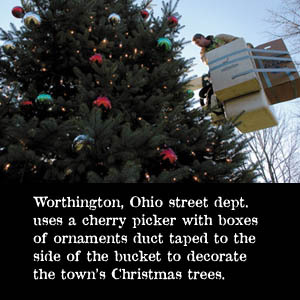 To see more holiday uses for the omnipresent roll of duct tape, click the holiday banner above! The Duct Tape Guys have the yule log burning brightly on the fire and have once again have the most heinous rendition of O' Holy Night you've ever been forced to listen to posted for one and all to hear! 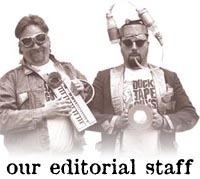 Introducing the Duct Tape Guys' (actually Jim's) latest invention! The perfect gift for the holiday season for the computer user in your life! SCREEN CLEANERS Click here to see a demonstration. I noticed that the Flintstones are having a Christmas special. How is this possible? Just exactly how are you supposed to react when your five year old writes "I love you Daddy!" in crayon on the living room wall? Hey, we got our new buttons in stock and are including one FREE with any book or video order from now until Christmas (including the Cheapskate's special). So place your orders now and you'll have a button to wear to the holiday parties! And, we are redesigning our Bumper Sticker, too. Watch for their availability in our Duct Tape Pro Shop this month! Order Apparel? Get FREE shipping! Get a set of five Duct Tape Guy postcards. Duct Tape Gardener While mowing the lawn I broke a branch on My Wifes favorite pepper plant. My trusty roll of Duct tape was at my side. 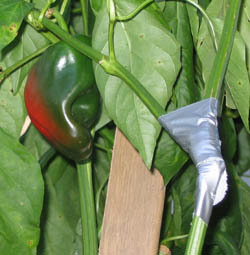 One strip of tape mended the pepper plant and saved My %$#@*. The branch healed and the plant survived. Proof, Duct Tape can be used in Horticulture. My dog injured a paw and required a bandage to be kept on it for 6 weeks. Of course it needed to be kept dry too, so after trying a few different things and deciding that dog boots are just to expensive (and not shaped like a dog's bandaged paw) I hit on the idea of using Duct tape. Putting a small kid's sock over the bandage and wrapping the lot in Duct tape made a custom sized-waterproof-removable boot. I am however ashamed to admit that I did let the vet use so called 'medical tape' to keep the bandage on... John B. If you have something posted on our web site, this shirt is for you! 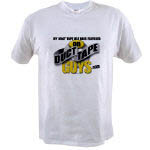 Click to the Duct Tape Pro Shop to pick one up today - specially priced! They come in a variety of shirt styles - even a nice cozy sweatshirt for fall and winter wearing! 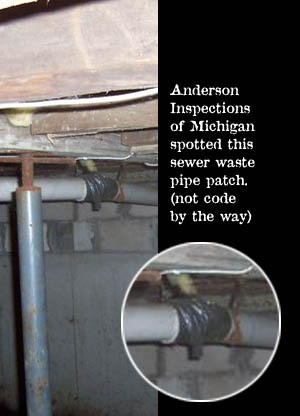 Thanks to eagle-eye Elise Sheppard who nabbed this duct tape sighting in Worthington, Ohio. Nice work (and kudos to the street workers on the good duct tape use). About two years ago my partner and I were on a cruise through the Mediterranean aboard a Princess Cruise liner. At dinner we noticed an elderly lady sitting alone along the rail of the grand stairway in the main dining room. I also noticed that all the staff, ships officers, waiters, busboys. etc., all seemed very familiar with this lady. I asked our waiter who the lady was, expecting to be told that she owned the line. but he said he only knew that she had been on board for the last four cruises, back to back. 5 They will even treat you like a customer, not a patient. An extra $5 worth of tips will have the entire staff scrambling to help you. 8. Clean sheets and towels every day, and with each new voyage you're provided a deluxe bath robe. Best of all you don't even have to ask for them. 9. If you fall in a nursing home and break a hip you are on Medicare; if you fall and break a hip on the Princess ship they will upgrade you to a suite for the rest of your life. Now here’s the best part! Do you want to see South America, the Panama Canal, Tahiti. Australia. New Zealand, Asia? Name where you want to go. Princess will have a ship at the dock, ready and waiting for you. So don't look for me in a nursing home, just call Shore-to-Ship. PS: And remember, when you die, they just dump you over the side at no charge.